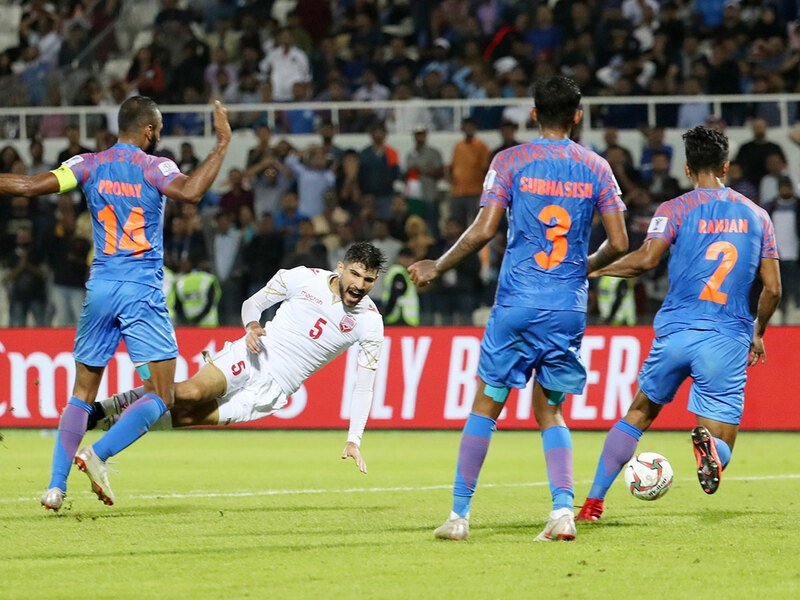 Sharjah: Football fans and pundits were full of praise for India Tuesday even as an injury-time penalty cost the Blue Tigers an unlikely spot in the Asian Cup knockout stages and prompted the coach to resign. Despite its giant population India is a footballing minnow at a lowly 97th in FIFA's world rankings, and its players are used to being overshadowed by the nation's glamorous millionaire cricketers. They did not even qualify for the last Asian Cup, but dared to dream of glory after stunning Thailand 4-1 in their opening match in the United Arab Emirates. Having lost to the hosts in their second match, the 0-0 scoreline going into injury time in their final match Monday against Bahrain would have been sufficient to see India through. But a rash foul by skipper Pronay Halder gave Bahrain a penalty, converted coolly by Jamal Rashed. The Hindu daily said India had "won hearts aplenty" with their performances, earning plaudits as they "threw their bodies at the ball, defended doggedly and put up a fearless display." "The Indians had endured a long journey to rub shoulders with Asia's best. Unfortunately for them, the journey ends here," the newspaper said. ESPN India said the bid to reach the knockout stages had been thwarted "in the most diabolical of ways". Coach Stephen Constantine stepped down after the game, but said "the boys have exceeded expectations" and that he was "exceptionally proud of the players for everything that they've given". Beaten finalists on their 1964 Asian Cup debut when it was a four-team competition, India last qualified in 2011 when they were thrashed in every game and let in 13 goals. "The positives are, the team is much fitter. Full credit goes to Stephen Constantine that he has made it very cohesive, very fit," commentator and author Novy Kapadia told AFP. "He has made the team that plays to a game plan." Fans too chose to highlight the good moments on the field. "We loved the way India played, especially against Thailand. They fought hard against UAE and Bahrain. Keep it up. Way to go.." said a Twitter user, Amit Jain. "Heartbreaking loss. but full marks to Chhetri and company for making us hope. lov u guys," wrote another, Jaya Singh. Indian defender Sandeep Jhingan thanked the fans. "We defended like warriors and the defeat is really hard to take," said Jhingan. "Disappointed seeing how it turned out but we can only go upwards from here. Proud of the boys and we thank the fans for their support." But despite the Asian Cup heroics, cricket remains the only game in town for most Indians. Striker Sunil Chhetri overtook Lionel Messi in international goals during the tournament, but few Indians would even recognise their football talisman. Millions of Indians do watch England's Premier League, but 34-year-old Chhetri has spent most of his club career in India's domestic leagues, barring brief stints with Kansas City Wizards and Sporting Clube de Portugal's reserves. Last year Chhetri made an emotional plea to Indians to fill empty stadiums after just 2,569 turned up to watch the national team play in the Inter-Continental Cup in Mumbai. But in a celebrity scene dominated by Bollywood actors and cricketers, footballers rarely make a broader impact beyond the sports pages. "Cricket is number one, every other sport has to accept that they can only compete for the number two spot," Kapadia said. He added: "We shouldn't get carried away (by the Asian Cup performance). It is a step forward. The team is still not World Cup material".